Rising oil and gas prices have brought big oil, plenty of workers and lots of housing headaches to the nation's fastest-growing boomtowns. 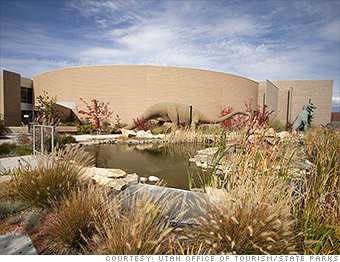 Vernal's dinosaur fossils are a big draw for tourists. Utah is the nation's 11th largest oil producing state, most of which comes from the northeast corner near Vernal. High energy prices have boosted the town's economy in recent years, according to mayor Gary Showalter. Besides the well-paying oilfield jobs, several branch offices of companies like Halliburton and Schlumberger have opened in the area, he said, with more coming. But the city isn't solely reliant on oil drilling to keep its economy afloat. It also has one of the largest deposits of natural gas in the country. And the area's natural beauty, Old West roots and excellent fishing draws tourists, as does the area's plentiful deposits of dinosaur fossils. There's also mining for an asphalt-like mineral called Gilsonite that is used in dozens of products. It's in high demand as an ingredient in oil drilling mud, which keep drill bits clean and cool. *Rankings are based on the change in annual population estimates for metropolitan and micropolitan areas between July 1, 2011 to July 1, 2012.